I love finding supplies to make jewelry at the hardware store. 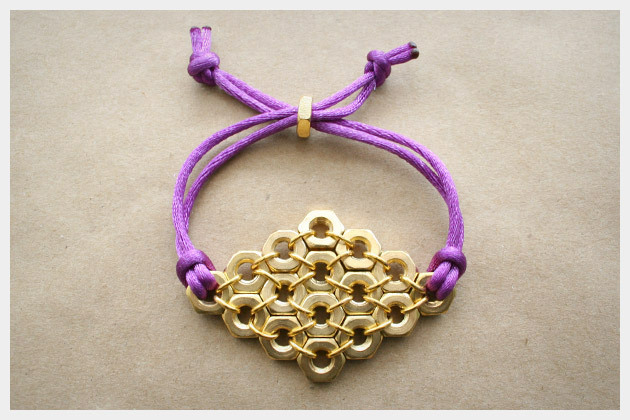 For this bracelet I revisited an old favorite the ‘hex nut’ and this time I brightened it up with a purple rat tail cord. You can easily stack this bracelet with all your others for a great look. Lay out your hex nuts to determine your pattern. Using your pliers, open your jump rings to fit around your hex nuts, you will be joining 2 at a time. Continue until you have joined all your hex nuts together and completed your pattern. Cut your rat tail cord in half. Fold it over and loop it through your end nut. Take one hex nut and feed your cords from each side through the hex nut. Tie your ends in knots. Using your lighter, carefully melt the ends of your cord. You don’t have to touch the cord with the flame and it melts very quickly. Please be careful. I actually set out to make earrings with this project. But when they were finished, even though they were cute, they were way too heavy! My ear looked like it was being pulled off! So I made an executive decision and turned them into a bracelet, which I think looks even better. 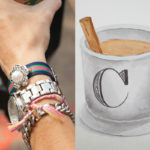 Let me know how your bracelet turns out, or would your wear them as earrings? I bought the jump rings at Michael’s Craft store. They are 1/4 inch in diameter. I apologize don’t have the packaging and I think that’s how they measure them. Maybe earrings would be cute and not as heavy if you only used four rings instead of 16? Also this looks like a cute tutorial ill have to try it. Thank you so much! I know what you mean about craftgawker!LOL It’s easy to get lost there! What a stunning piece of jewelry…awesome.. love that you’ve used purple! I think a necklace to match should be next! Very cute. What size hex nuts did you use? And what size jump rings? I am attempting to make this bracelet. I am using #6-32 brass tone hex nuts. I tried linking two nuts together with a 6mm jump ring and it was too big. I tried a 4 mm and it was too small. I am going to get some 5mm jump rings; they should be the right size. If not, I will resort to using 26 gauge wire to link the nuts. So lovely! Must try it. How did you get the last strand through the nut that secures the end of the bracelet? Where’d you get all of these supplies? Like the rat tail cord and the hex nuts? I really want to make this! I bought the hex nuts at The Home Depot, any hardware store will have them. The rat tail cord is available at JoAnn’s fabric store or most any fabric store. JoAnn’s also carries the jump rings and so does Michaels craft store. What a great idea. Just wondering, are these 1/4 inch hex nuts? that’s a really good idea ! 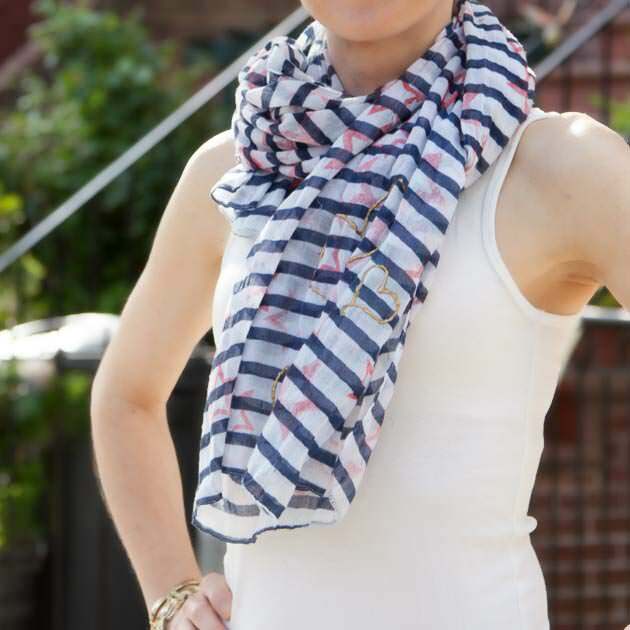 Thank you so much for including me on your blog! I am going to make a few different bracelets to sell at a bazaar my friend is throwing – and I have just added this to my list!!! How cute!!! I will let you know how they turn out! I don’t have the package any more, so I can’t give you the technical size, but measuring from outer flat side to outer flat side they are 3/8 of an inch. I almost bought all the supplies today. But I did not know the dimension of nuts. That looks great! So funny how blunders can be turned into beautiful pieces that weren’t originally thought up. That’s how most of my stuff is made! Thanks Andrea! It’s so true! If you really believe in something don’t give up on it. It’s like they say “from our greatest failures can come great accomplishments”. Wow what a great idea using black suede! I bet it looks amazing with the black and gold! 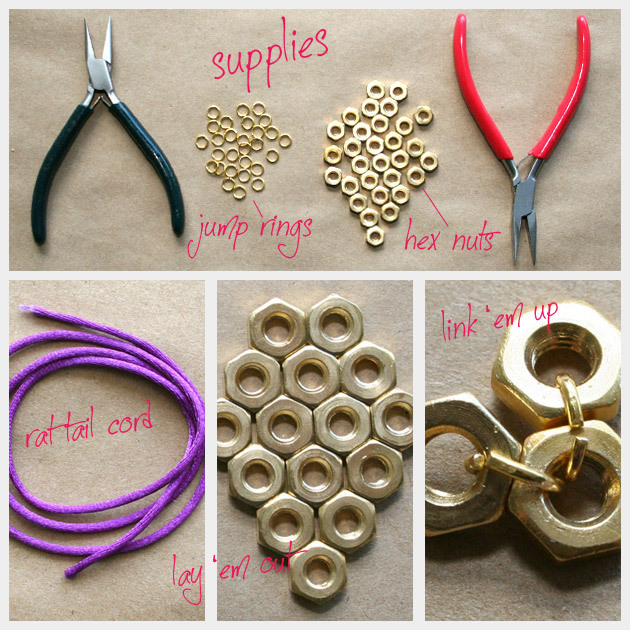 I WILL BE DOING SOMETHING SIMILAR USING THE NUTS AND JUMP RINGS. CAN YOU PLEASE TELL ME WHAT SIZE JUMP RINGS IN DIAMETER/ AND WHAT SIZE NUTS YOU USED? I LIVE IN A SMALL TOWN AND MUST ORDER THE JUMP RINGS ONLINE. The jump rings I used are 1/4 inch in diameter. What does â€ stand for, when you are talking about the measurement for the rattail cord? Inches? Yes, it does stand for inches. I apologize, there were a lot of bugs in the text when we transferred to the new website. I think I’ve fixed all of them on this post. Please let me know if you have any other questions. I am attempting to make this bracelet. I am using #6-32 brass tone hex nuts. I tried linking two nuts together with a 6 mm jump ring and it was too big. I tried a 4 mm and it was too small. I am going to get some 5 mm jump rings; they should be the right size. If not, I will resort to using 26 gauge wire to link the nuts. She does say 24″ of cord and explains how to loop it through. I wish I could find a video of this bracelet being made. Adorable! More hours in the day pleas!! Does the bracelet stay on? Does it loosen when you wear it? Thanks Carrie!!! I’m so glad you like it! With the nuts being connected with jump rings and the movement a bracelet endures on a wrist, would the jump rings ever loosen up causing the entire thing to unravel…? If so, how could this be prevented? This worries me a lot. I wouldn’t want all the nuts to spill out all over the floor one day. The jump rings are really strong. You have to use pliers to open them to attach the hex nuts. I can’t imagine that they would come undone on their own. 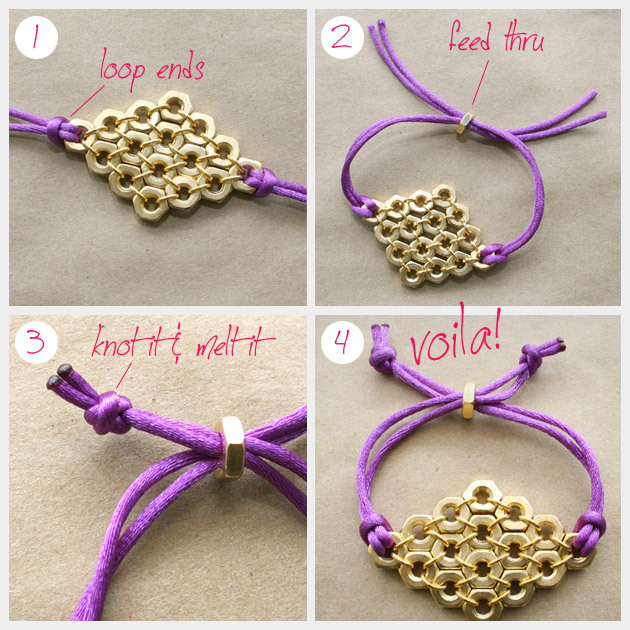 I will definitely gather the nuts and cord to make this bracelet now! I don’t comment often, but feel this is important. Please take care when wearing hardware metals against the skin. These items are made for house building and not made to be worn against human skin. Hardware components do not go through testing standards that all jewelry and jewelry components go through to be made safe for human wear. There is a whole host of chemicals on hardware store items that can do potential harm. IE lead, cadnium, formadehyde and other hazardous chemicals. I love this design. Could you tell me what size hex nuts and jump rings you used+? I tried making this but couldn’t match up the hex nut size with the jump ring. I would really like to do this as Christmas gifts since I have very limited money.